The Survation omnibus offers external researchers the opportunity to ask a small number of specific questions about a topic of particular interest. In our recent omnibus, Electoral Calculus used this opportunity to ask respondents across the UK about their preferences for the terms of the UK’s Brexit deal. Using Electoral Calculus definitions of the different types of deal from their “Brexit Spectrum”, respondents were asked to rank five possible ways of exiting the European Union, in order of preference. Data tables are available here. Thinking about Britain leaving the European Union, or ”Brexit”, and the different ways this might happen, please order these five possible outcomes from your most favoured outcome to your least favoured outcome. – “No deal” – Britain leaves without a specific deal, and gains full control of immigration, laws and trade, but British exports to the EU are hit by tariffs and other barriers. – “Canada-style” – a negotiated free-trade agreement between Britain the EU, similar to Canada’s deal. 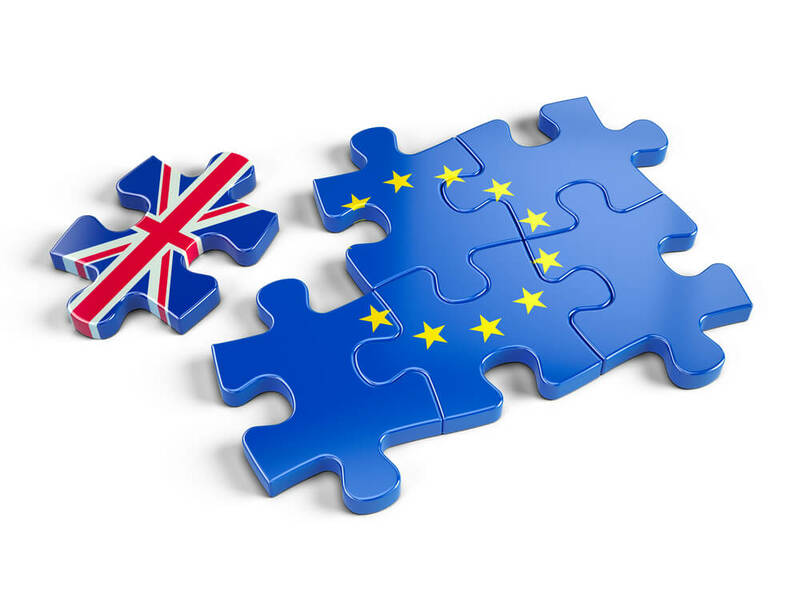 The UK has control of its own immigration, laws and trade but has to match EU regulations in some areas, so that many British exports to the EU are OK.
– “Chequers” – the government’s current plan. Britain remains in the EU single market for goods and agriculture, but not services. Freedom of movement and some budget payments might remain (depending on negotiations). – “Norway-style” – membership of the European Economic Area, similar to Norway’s deal. Britain remains fully in the EU single market, but outside the Customs Union.Freedom of movement remains, along with EU single-market regulations, and half-rate budget payments to the EU. – “Customs union” – Britain remains in both the single market and the Customs Union. Freedom of movement remains, along with EU single-market regulations with large annual payments to the EU budget and Britain cannot sign its own trade deals. No single option received over 50 percent of first preferences. 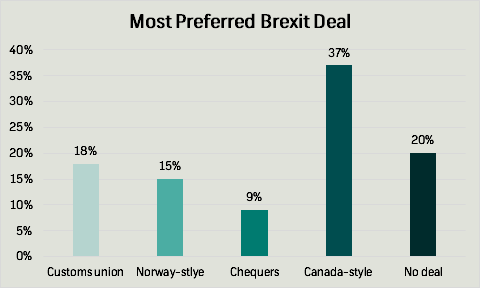 A Canada-style arrangement, consisting of a negotiated free-trade agreement between the UK and the EU, with the UK gaining autonomy over immigration, laws and trade but matching EU regulations in some areas emerged as the most favoured outcome, receiving 37 percent of first preferences. 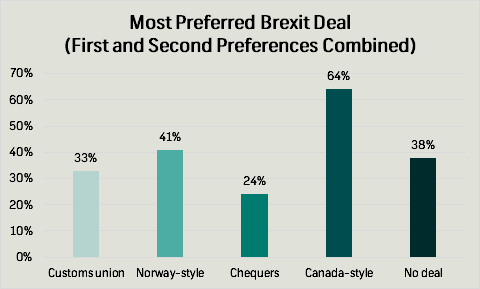 When first and second preferences are combined, a Canada-style deal receives majority support, with 64 percent of respondents placing it as one of their two most preferred outcomes. There was an even split between support for those options offering the closest and most distant relationships with the EU post-Brexit. Twenty percent gave their first preference to a ‘no deal’ Brexit, which would see the UK leave without a specific deal, gaining full control of immigration, laws and trade, but seeing tariffs and other barriers placed on exports to the EU; 18 percent, meanwhile, opted for membership of the single market and customs union, which would entail continued accordance with single market regulations, contributions to the EU budget, freedom of movement and no ability for the UK to sign its own trade deals. Reflecting their polarising nature, these were also the two outcomes the public was most keen to avoid, with 37 percent saying ‘no deal’ was their least preferred outcome and 28 percent saying the same for remaining in the customs union and single market. Theresa May’s Chequers plan received the fewest first preferences, as only 9 percent said they would favour a deal which keep the UK in the single market for goods and agriculture but not services, and which could see freedom of movement and some budget payments continuing after Brexit. 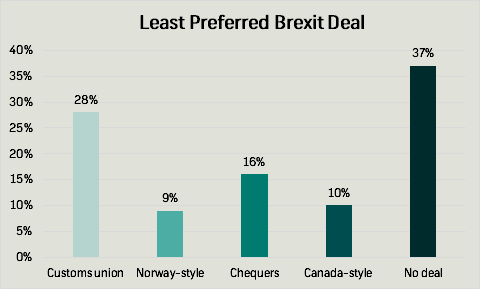 The so-called ‘Norway option’ of leaving the customs union while retaining single market membership received 15 percent of first preferences, the second fewest; interestingly, when respondents’ top two preferences are combined, it becomes the second most popular outcome, attracting 41 percent of first and second preferences, a finding which perhaps suggests that many view it as an acceptable, ‘middle of the road’ compromise. Under this outcome, the UK would be obliged to accept free movement and adhere to single market regulations but would make only half-rate contributions to the EU budget. The topline figures in these data tables vary slightly to those published by Electoral Calculus due to the different weighting procedures used. 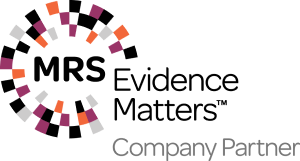 These data tables show the results from our standard weighting procedures, but Survation can supply raw data to clients from omnibus and bespoke surveys for their own analysis. 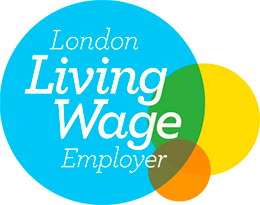 More information about Survation’s omnibus services can be found here. Survation polled 1039 people aged 18+ in the UK on behalf of Electoral Calculus. Fieldwork was conducted 7th September 2018. Data tables are available here. 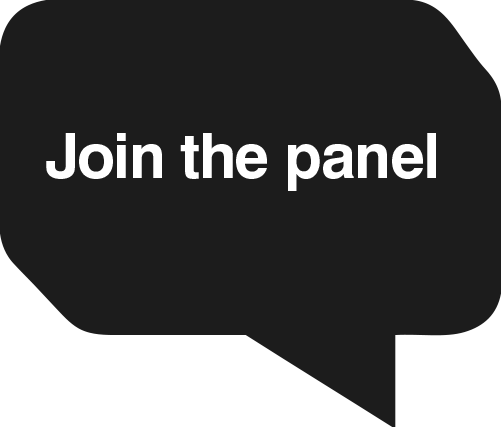 Survation’s paid consumer opinion panel is now live. Simply go to: https://panel.survation.com/ – register (1 minute) and we’ll credit your account with 50 points for simply confirming your email and allocate 100 points for taking a very short survey. Points convert to cash which can be withdrawn each time you reach the equivalent of £50.